Boycott - basically its a tool of the weak, who individually are weak but collectively can have some strength against overweening power. The first use of the word was a combination of tenant farmers in Ireland against their land agent, famous cases are the Montgomery Bus boycott and little more recently the sporting boycott and other boycotts against South Africa. There are difference between all these boycotts, and I would stress that by taking the archetypal case of that of the tenant farmers who resisted the land agent Charles Boycott, who gave his name to the whole process, in the 1880s in Ireland. Boycott was the land agent for an absentee English noble. And what they did, when he became too domineering, is they denied him labour to save the harvest, they put him into isolation - refused to talk to him under any circumstances, they shops wouldn't serve him, the workers wouldn't go and look after his house for him, and the person wouldn't deliver him letters. And in reasonably short order, by the end of the year Boycott had been forced out and returned to England. So very direct. The South African sporting boycott was nothing like that. Sport does not have that effect on anyone, making is impossible for them to function, thought the lack of sport. The South African population was in any case waging its own struggle, including the armed struggle. The sports and other boycotts were about how outsiders could help that internal struggle, how world civil society could get its act together and show their support. If they could demonstrate their support its very encouraging to those who are locked in an uneven struggle internally, the oppressors feel the wind of disapproval, the outrage of apartheid was embedded in the daily activities of us as protesters so we were continually reminded every time we didn't buy an Outspan orange why we weren't doing it. 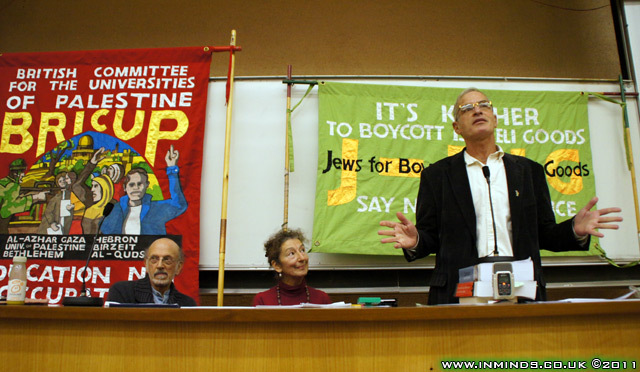 The boycott became a focus for recruitment and for education, people were made to think of why it was that the boycott was going on. 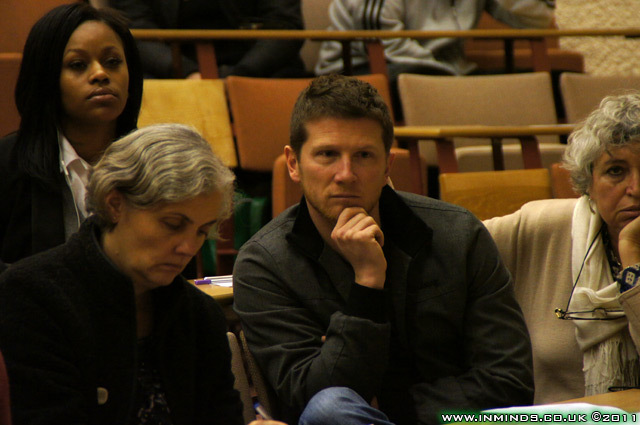 And of course there were direct psychological and economic effects on South Africa as the target. But those economic effects, the direct economic effects of the sporting and other boycotts was not what brought South Africa down. The sporting boycott is the one that's mostly remembered, because its so dramatic as it hit the South African 'whites' in a significant aspect of their identity. You'll notice that the sporting boycott of Israel is not so prominent, it would be a bit like breaking a butterfly in a wheel. 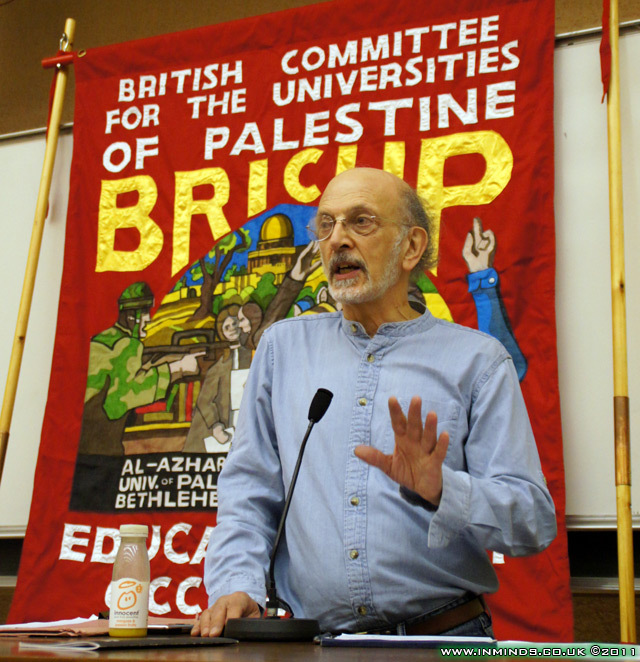 But it wasn't only a sporting boycott of South Africa, there was an academic boycott - actually it was rather more fierce than the one against Israel, more tightly drawn. Then there was a cultural boycott, a consumer boycott. And all these boycotts combined did not bring the South African apartheid regime down with all its military might and its nuclear weapons - shades of Israel, same kind of overwhelming force. But these boycotts did contribute in an indirect way, started the motor of change which eventually did force the end of apartheid. Now its not necessarily the case that that's what will happen in Israel / Palestine, but you can be sure it will happen, we just don't know the mechanism by which it will happen or the significance of the boycott in that process but do know it's what we can do from here, and it does look from the sensitivity of the Israelis as if its a pretty good tactic. 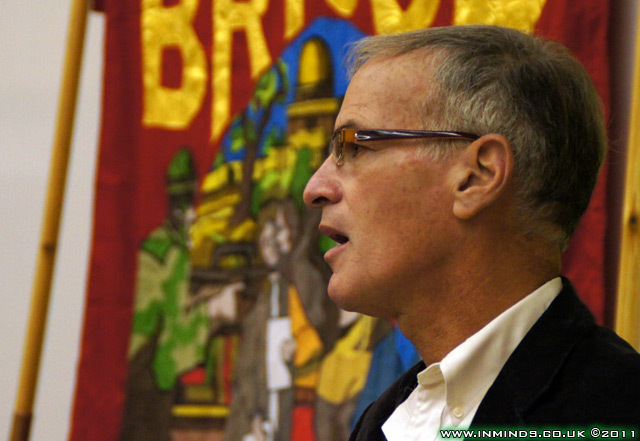 In the South African case it was a long and tortuous path going from the start of the boycott in the 1960s to the end of the apartheid regime in the early 1990s. It was initiated by people like you and me, it wasn't initiated by governments or corporations. 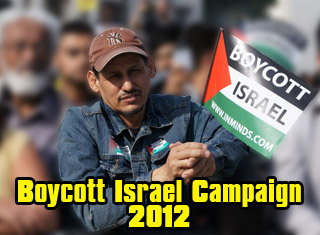 the boycott of Israel, I think we can say, still has some way to go. It was targeted not at the individual orchestra members, but at the orchestra itself which is a major cultural institution of Israel. It proclaims on its website that's its proud to be a cultural ambassador for Israel, it boasts of its services to the Israeli defence forces - going and performing at various units and so on. So they became by their own choice a representative of the Israeli government and as such they were targeted. 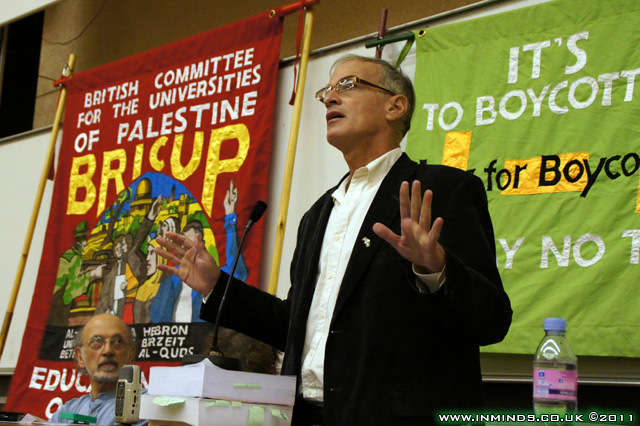 He ended by answering some of the limiters that some try to put on the boycott - for example the TUC suggesting that the boycott should only target the settlements. 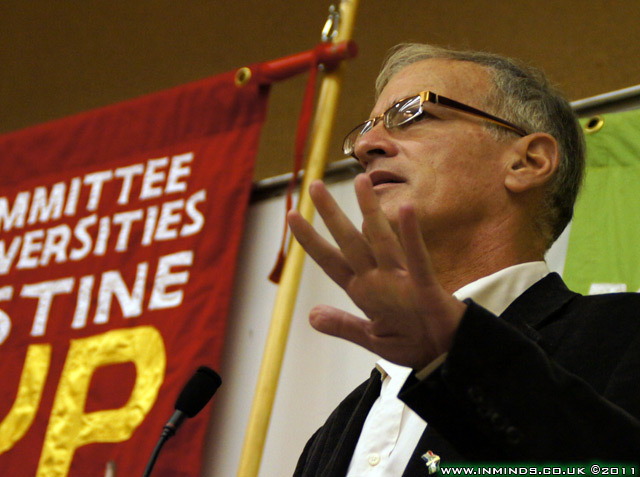 Professor Norman Finkelstein is a renowned analyst of the Israel-Palestine conflict. 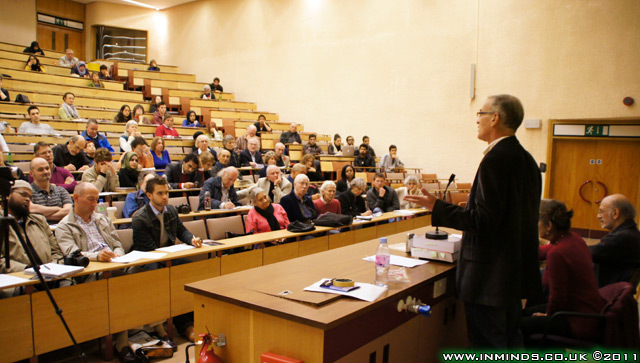 He is well known for his seminal work on the "Holocaust Industry" (how Israel has callously used the genocide of the Jews in furthering its zionist cause), and for his demolition of Dershowitz's "case for Israel" and with it Dershowitz reputation as an academic. Such accomplishments have not gone unnoticed and he is constantly in the cross-hairs of the guns of the Israel lobby and has made great personal sacrifices for his stance against Israel. He commands the respect of all pro-justice activists. 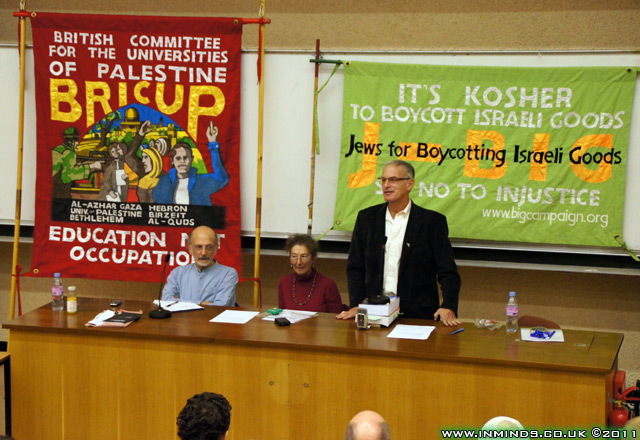 BDS is one tactic, its not THE tactic as some exponents of BDS would like us to believe. Its one of broadly speaking three tactics. 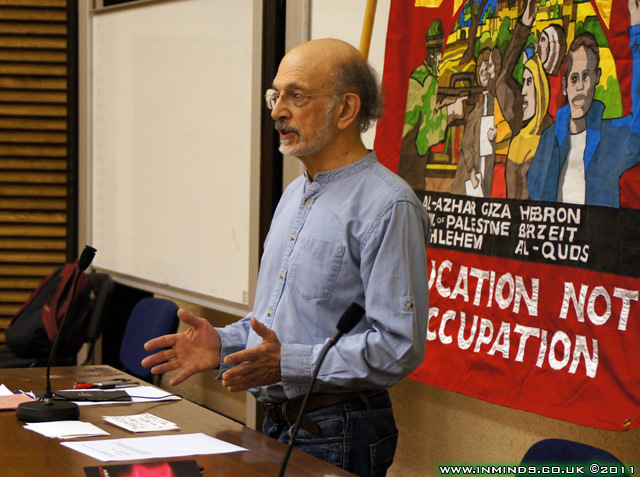 One, which had some salience in the UK in particular is what you might call the legal strategy, its peak came with the issuance of the Goldstone Report and the attempts around the Goldstone Report to utilise the provision in international law for Universal Jurisdiction to hold Israelis accountable. That to me was a very promising tactic, obviously as everyone know extreme constraints have been imposed on it in the UK, but it was a promising tactic, it was a useful tactic. 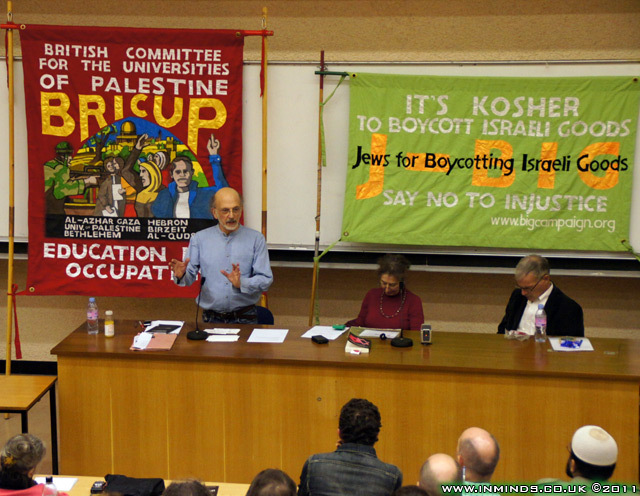 Its not BDS, it was a seperate tactic which has its own, in my opinion, moral authority and political authority. Then there is the second tactic - various forms of non-violent action. If the Goldstone Report was the pinnacle of the legal strategy then the pinnacle of the non-violent civil disobedience tactic was the flotillas, most notably the Mavi Mara. Note this is a seperate tactic that's not BDS. 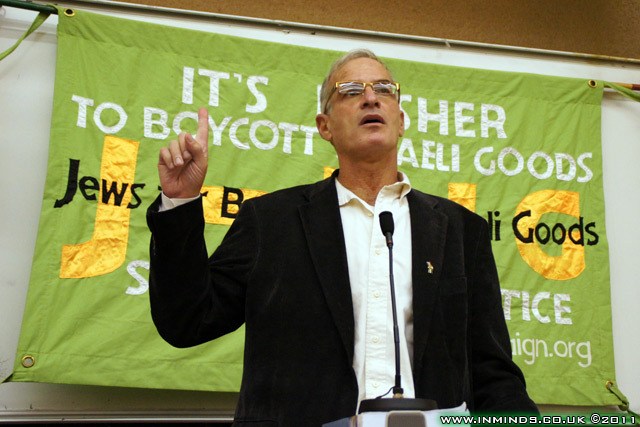 So you could say that BDS is one of three broad strategies that's been attempted. All of them have registered some success, none of them has been resoundingly successful. All of them have registered some successes and significant setbacks. 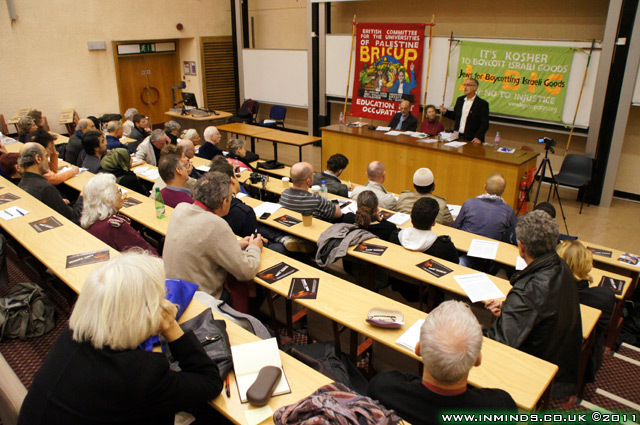 So at this point I would say its premature to label any strategy as THE strategy and I do find it troubling that say when I come to the UK there is a session specially allocated to BDS and there are no other sessions allocated to other strategies. And that to me again is an indication of a creation of a cult which worries me. 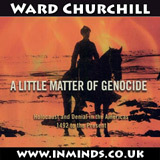 ..you couldn't find a more morally unimpeachable tactic [BDS] - its non-violent, it doesn't use any forms of force, even force of language, the tactic itself is unimpeachable but it has to be attached to a goal that will reach the public, now it you attach it to a goal that does not reach the public its a dead end. 'Okay we'll boycott, but till when? Till the Palestinians say stop. Is that going to convince anyone? In my opinion rightfully it shouldn't convince people. There is a standard we should use, a standard which I think is effective, a goal which I think can work, and the goals is we want to uphold the law. There are a whole series of international resolutions, legal findings, we want to implement the law.. The resulting contovery is covered in Naomi Foyles article reproduced with permission below. 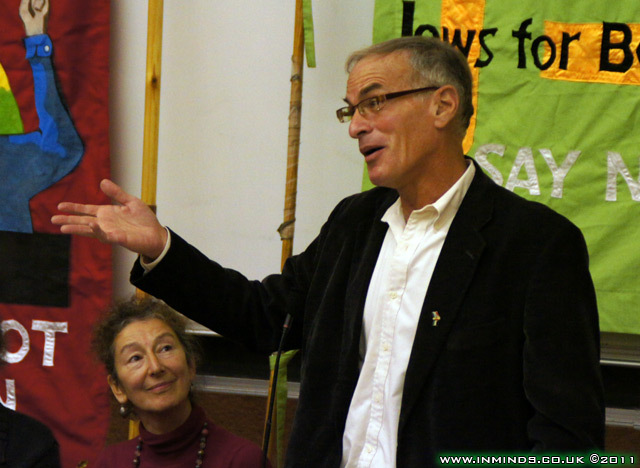 Norman Finkelstein's fixation with a bantustan solution for Palestine which like South Africa's bantusans packs Palestinians into a mere 18% of their land and hands the rest over to Zionist colonists to continue their racist apartheid project in has been covered previously by ourselves here and more recently in Tony Greenstein's article here. The bantusan solution, where blacks would be rounded up and packed into so-called homelands leaving a racist apartheid state intact in the rest of South Africa, as promoted by the apartheid regime and its quislings, was never accepted. Any outcome which left intact a racist apartheid state was rejected on principle. Yet in the case of Israel those principles seem to have vanished, and a bantusan solution which leaves a zionist racist state intact in 82% of Palestine is hailed as a goal to aim for, and the reasoning given is that we have to be realistic, the oppressor will not accept a one state solution so we shouldn't strive for it! Also no one in the solidarity movement questioned the use of violence by the oppressed blacks who faced the bullets and torture of the ruthless apartheid regime in South Africa, yet Palestinians who face far greater violence - f-16 fighter jets, phosphorous bombs, and tanks, are criticised and even condemned for their armed resistance. When the South African apartheid regime wanted to assassinate Ruth First, ANC founding member and wife of Joe Slovo, the leader of the military wing of the ANC, they used a letter bomb. When the Zionist regime wanted to assassinate Salah Shehade, head of the military wing of Hamas, they dropped a 1 ton bomb on the three story apartment block his family lived in, killing 14 people including 8 children. It is in this context, when considering the oppressors disproportionate use of violence, that armed resistance can be understood.